Industrial Magnetics, Inc. announces their new, Self- Cleaning, Pneumatic Line Housing(PLH) for dilute-phase pneumatic systems to improve product purity and protect processing machinery from tramp metal damage. An industry first, the PLH incorporates a series of 1 in. dia. rare-earth tubes on staggered centers, versus a single, center-flow cartridge circuit often prescribed for pneumatic line systems. This configuration ensures that all product flowing through the housing makes repeated contact with the magnets. The resulting capture rate of ferrous and weakly magnetic stainless contaminants far exceeds any other magnetic separator available for this type of application. Now available in a new, Self-Cleaning style, the Pneumatic Line Housing can be routinely cleaned of captured metal contaminants by the simple flick of a switch, encouraging frequent and routine cleaning for optimum magnetic performance and eliminating the time- consuming and tedious process of removing collected metal by hand. 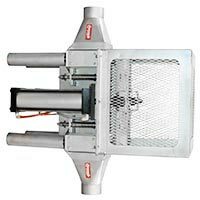 Operational in either horizontal or vertical orientation, the sealed unit eliminates line pressure drops and surges, is leak-proof up to 15 PSI and is suitable for processing dry, powder, and granular materials. Nedox® coating on the magnetic tubes provides protection from abrasive particulates or corrosive materials and helps prevent product bridging or clogging in the magnetic housing.